Denis Leclerc, owner of Albi le Géant, says dealers shouldn't dismiss weather as a factor in selling vehicles. LAVAL, QUE. 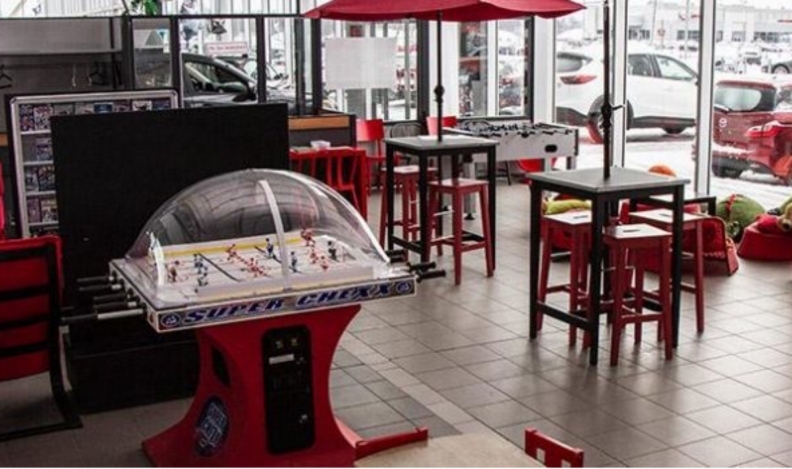 — Some Quebec dealerships are “going large” by bringing their entire inventory indoors where customers can shop year-round in short-sleeve comfort, but it’s not exactly a trend in la belle province. 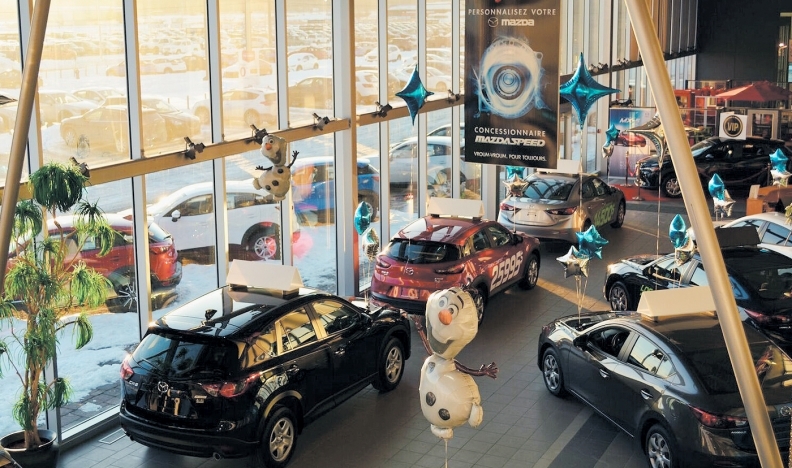 Albi Mazda in this community bordering northwest Montreal, is among the leaders; with 239,000 square feet (22,000 square metres) of showroom space, it can display 200 cars indoors, making it one of the biggest Mazda dealerships in the world. This provides the luxury of showing each color and trim level for any given Mazda model in a climate-controlled environment, according to Denis Leclerc, owner of Albi le Géant, a Sherbrooke, Que.- based network of 24 dealerships in the Montreal area. Albi leads Mazda dealer sales in Canada, and a dealership this size gives his group serious leverage. Albi Mazda has a relaxation area for customers. Leclerc creates events to attract clients to his dealerships. In a Chrysler dealership he also owns, he assembled an “SRT suite” to show all the Dodge high-performance models together. “Things like that bring people in, and help sales,” he said. Leclerc sees only one downside to bringing inventory indoors: cost. “You need a lot of money to do that. If you take a medium-size dealership, you will easily invest two or three million dollars more to bring your cars indoors. Leclerc said that dealers shouldn’t dismiss weather as a factor in selling vehicles. Daniel Beaucage of Groupe Beaucage owns 25 dealerships, but none have an all-in- door inventory. “It’s just too much money,” he said. A square foot of land is about $15 for an outside lot compared to $125 for an inside space. Other significant costs include making space for personnel, lighting, heating in winter and air conditioning in summer. “We did the math and it’s not worth it for us. There are a couple [of fully enclosed] dealerships in Québec, but I don’t think it will become a trend,” Beaucage said. “The cost of doing business is too high. Winter is a reality and we learn to live with it. “All my dealerships can contain 10 to 12 cars inside, and the rest are outside. I am OK with this. Three- and even four-story dealerships are appearing across the United States, and several have opened in Toronto, but dealers must plan carefully, Leclerc says. Beaucage said that markets outside large urban centres are too small to support an indoor-inventory business model.